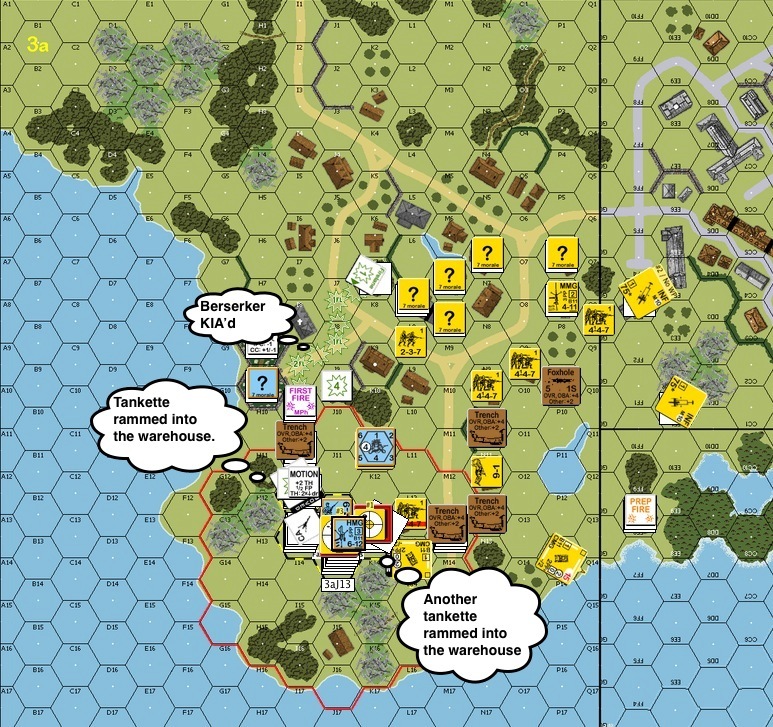 AP54 800 Heroes is the second scenario I played that is designed around the Battle for the Sihang Warehouse in Shanghai. The first one I played was A110/ASL13 Shanghai in Flames. I believe there’s at least one more : BFP31 Chinese Alamo that covers the same battle. The subject matter’s the same but the scenario designer’s treatment is very different. The date was 29 October 1937. The Imperial Japanese Army (“IJA”) had made successful incursions into Shanghai. Most Chinese units had retreated and the western powers were uninvolved at this stage. Chiang Kei Shek (the Generalissimo) was determined to keep the battle in world’s view and hence decided to keep the fighting in Shanghai which was already an international city at that time. 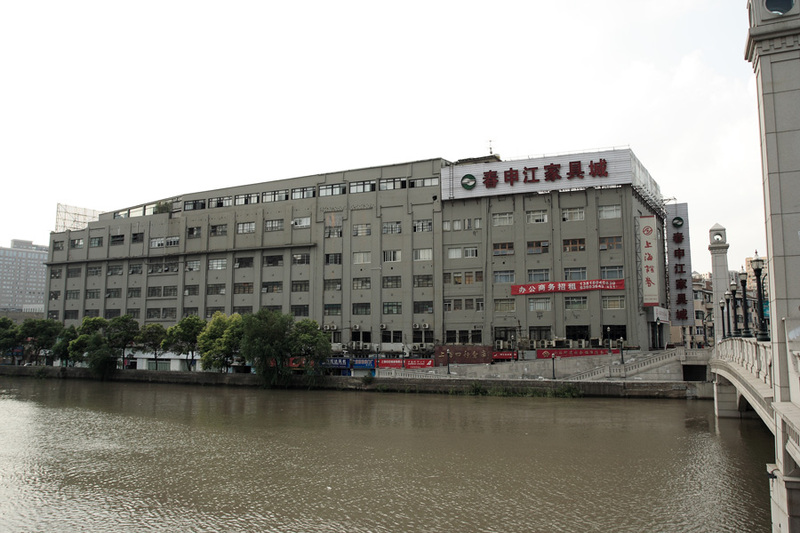 Sihang Warehouse had the distinction of being right across a stretch of water from Shanghai’s International Concessions. It was the place where Chiang wanted to bring China’s struggle to the world’s attention. A battalion from the 88th Division, a German trained élite unit was hence given the task and so the name “the lost battalion” as they were the last to leave. Witchbottles played the Chinese defenders and I the IJA. This was a training game and the great tactics on both sides were his and the bad ones mine. This was the setup. The IJA were free to setup certain units to the right of the map or enter via the North (top) or the East(right). IJA tankettes didn’t have radios and were therefore setup in platoon formations. The building to the lower left of the map was the warehouse (factory) and was fortified. The red ring denotes the area where Chinese units were fanatic. This is a 5.5 turn game. 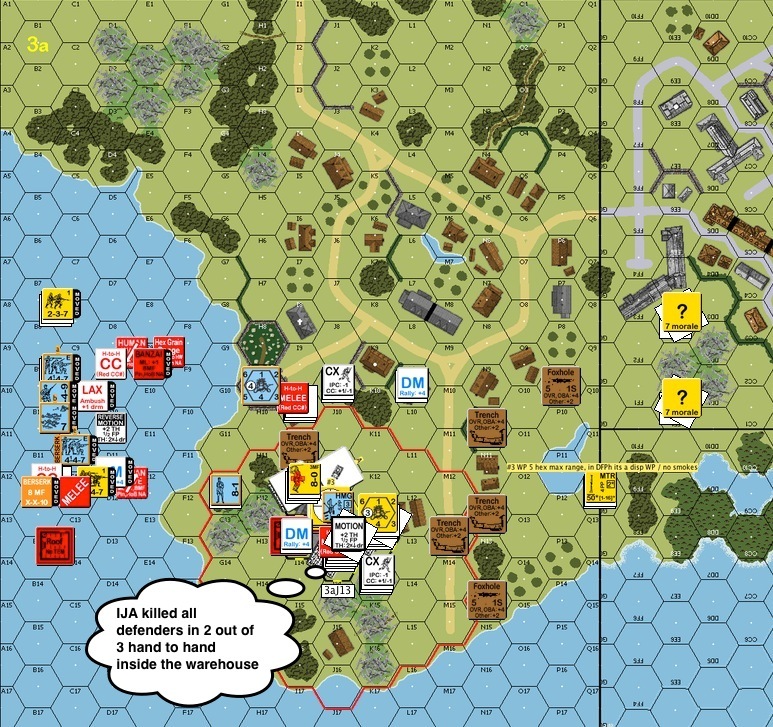 The victory conditions for the IJA were either to control the warehouse or to control 3 or more hexes of the warehouse plus all other buildings in the Chinese setup area. IJA Turn 1, the first thing the IJA needed to deal with was the heavy machine gun (“HMG“) sitting on the top of the warehouse. After laying down white phosphorus and smoke, two tankettes started coming in from the north. After bypassing some buildings, the world exploded around one of the tankettes. It was a set demolition charge! What both sides didn’t realize at the time was that set DCs don’t affect AFVs (armored fighting vehicle). 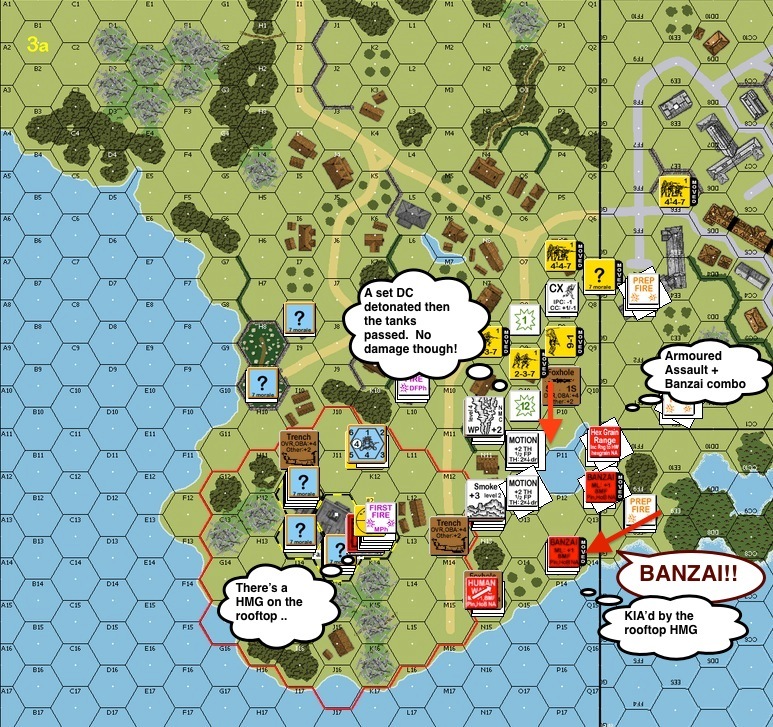 The IJA worked out an Armour Assault together with a Banzai charge out of the woods. The IJA thought if they could cut off the line of trenches from the base they might get a chance to stop the Chinese squads from retreating back into the warehouse. An 8-0 IJA leader and his squad wandered out of the smoke cover and were the first to be met with a hail of bullets from HMG on the roof. The group disintegrated on open ground. The rest of the charge hug closer to the tankettes and kept on. A tankette overran a Chinese trench, and a IJA squad piled in. The tankette bogged but the Chinese squad was pinned from the shock. Pinned as they were, they survived the overrun attack and shot at the rear of the attacking tankette. 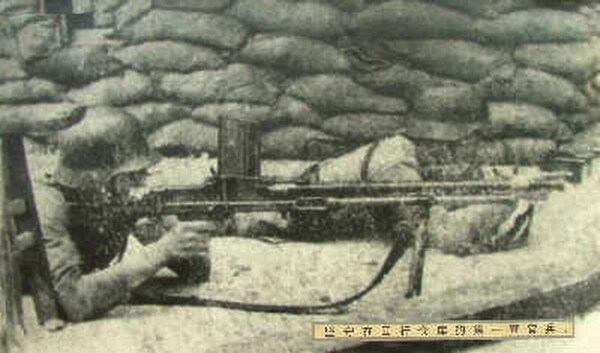 The LMG broke and so did the men, the Chinese squad broke and ran towards the warehouse. This was the end of the Chinese Turn 2. The defenders took advantage of the IJA smoke. A Chinese squad ran across the warehouse floor and threw out a demolition charge. “CANDYGRAM! !” they yelled. 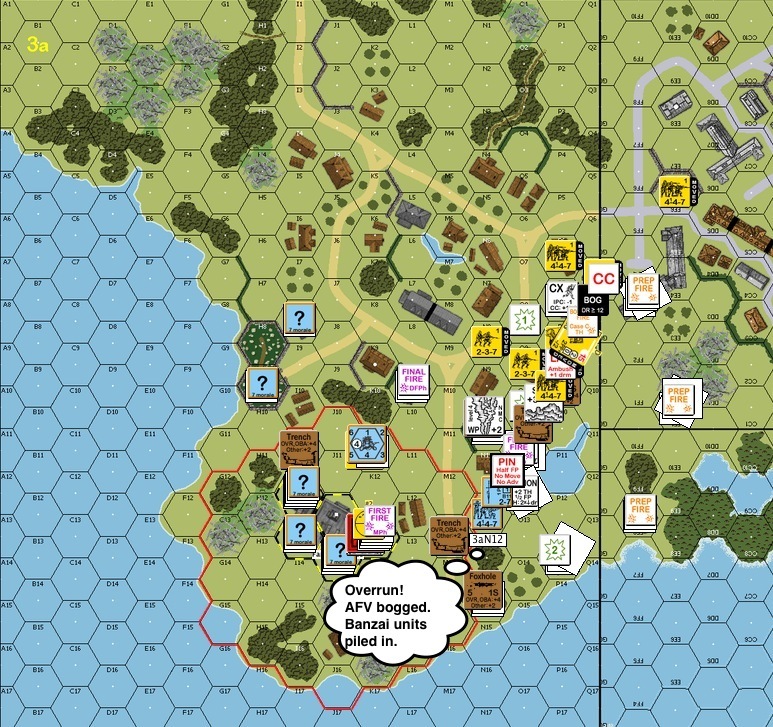 The explosion striped the approaching IJA squad who caught a DC on their laps a moment ago. A little way behind him was a medium machine gun squad, and they blazed away. On the third shot the IJA tankette exploded. Another IJA tankette slammed into the right of the warehouse as well, one tankette in the face of 3 machine guns. Please do not for a second mistook my blissful ignorance of tank rules for bravery though. Nonetheless, two breaches were made in the fortified warehouse and close combat ensured on the right of the warehouse after the defenders immobilised the tankette. The Chinese piled a hero and a berserker into the melee. Another squad tried to creep up on the IJA tankette sitting outside so that they can blow it up before it too slams into the building. Unfortunately the squad was shot in the rubble outside. IJA Turn 4 got even more intense. The tankette on the right make another breach in the warehouse. The tankette to the north was shot and killed by an MMG before it could hit the warehouse walls. IJA troops from the north finally made it to the perimeter. 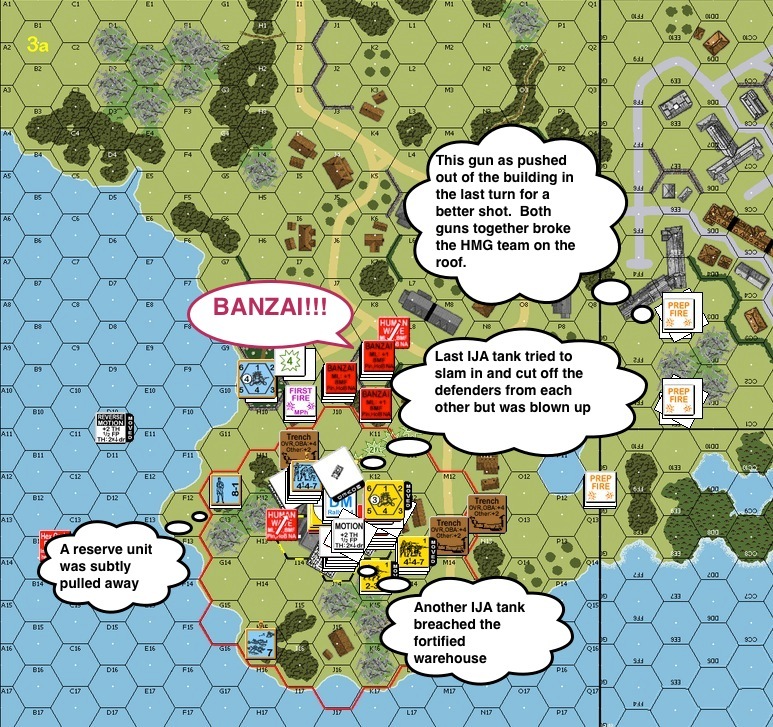 At Witchbottles’ suggestion, they decided that a Banzai charge was in order!! 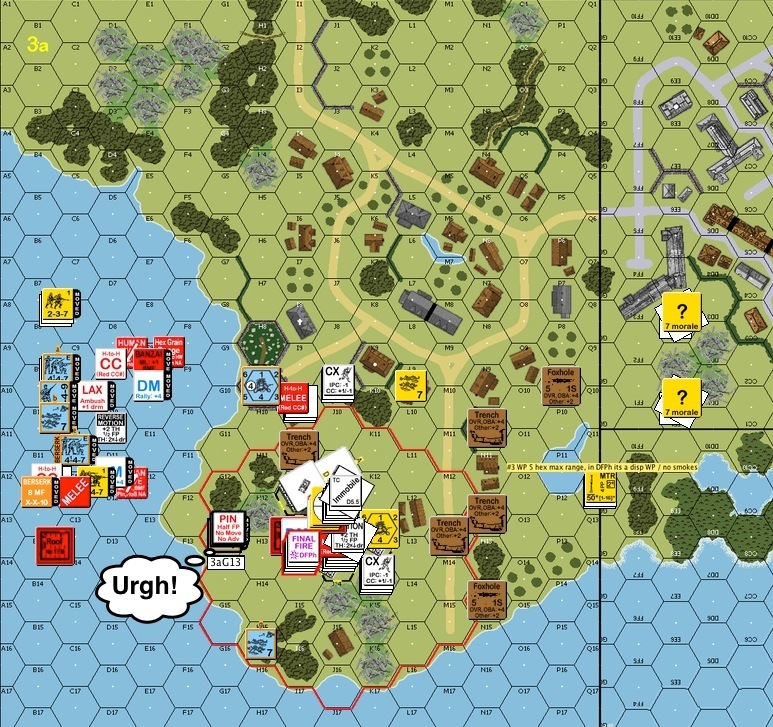 This was the situation after the Close Combat phase. The IJA killed all defenders in 2 out of 3 hand to hand combats inside the warehouse. Chinese Turn 4! The reserve unit that slipped outside earlier tried to make its way back into the warehouse. Unfortunately it broke under a hail of IJA gun fire and was pinned outside. This is where the story ends as the Chinese didn’t have enough bodies to take the warehouse back. In reality, the 423 Chinese defenders held out for another two days. They succeeded in winning international attention to the Sino Japanese war. The British allowed them to retreat across the New Lese Bridge into the International Concessions. The Sihang Warehouse still stands today. What thoughts do you have? What would you have done? What are your experiences playing this scenario? 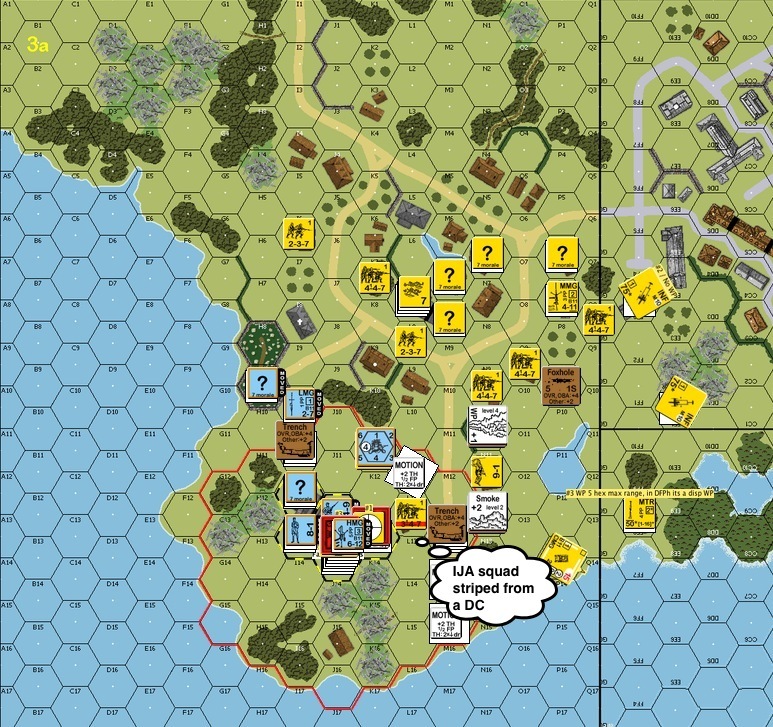 This entry was posted in Game Play and tagged AAR, Advanced Squad Leader, Advanced Squad Leader Rulebook, Board Game, China, Hong Kong, Imperial Japanese Army, PBEM, Shanghai, VASL. Bookmark the permalink. What has been your favourite of the two scenarios and do you have any preference as to the histocicisity (made up word but you get the drift of it) of each? Hey Joss! This is an interesting question. Well, to that question, I have to say I am not familiar with the battlefield layout at the time. However, if you look at the simple map here .. Sihang Warehouse. You will see that the warehouse (light yellowish green) is right by the Suzhou river. The foreign concessions were on the other side of the river and during most of the battle, that’s where the foreigners watched the battle raged on while they go about their business. The bridge you see was the bridge over which the British finally allowed the Chinese troops retreat across amidst IJA machine gun fire. Both A110 Shanghai in Flames and AP54 800 Heroes put the warehouse in a corner of the map to restrict freedom of movement. I love AP54 800 Heros for the fact that I played a high grade player and his bag of tricks was simply dazzling. When it comes to the “feel” of the scenario, I prefer A110 Shanghai in Flames. – was a proper city fight where Chinese troops had to do a fighting retreat street by street back into the warehouse. – fires were raging and the Chinese troops were busy setting their own fires in key locations. Fire hurt both attackers and defenders alike but the longer the Chinese stay on, the more the fires rage by the time the IJA gets there. However the longer the Chinese stay at a place, the more likely that the IJA will infiltrate and get behind them. – I could feel the desperation as Chinese troops fought, ran, some got overran, some got hit by Banzai charges, some broke because their location burst into flames. I could almost smell the smoke, taste the fear and see the IJA charge through the flames. Not sure I’d call myself a “high grade” player,LOL. Pretty sure I’d be considered an “average” experienced player, with a 50-50 rough record for game play and about 50-60% of the rules memorized/ retained correctly and the confidence in being able to find the answer to a rules query at 75-85% of the time easily ( ie knowing where to look). I would say more than 90% of ASL players with more than 100 completed games overall would fall into this category, the remainder would actually be “high – grade” players of the capability of the Forts and the Action Burkes and such of the ASL world. but thanks for the vote of confidence, Jackson! I got 20 completed games so far .. 80 to go. Let’s see if I can answer rules queries 75%-85% of the time easily by then!! Thanks again for your patient tutelage!! 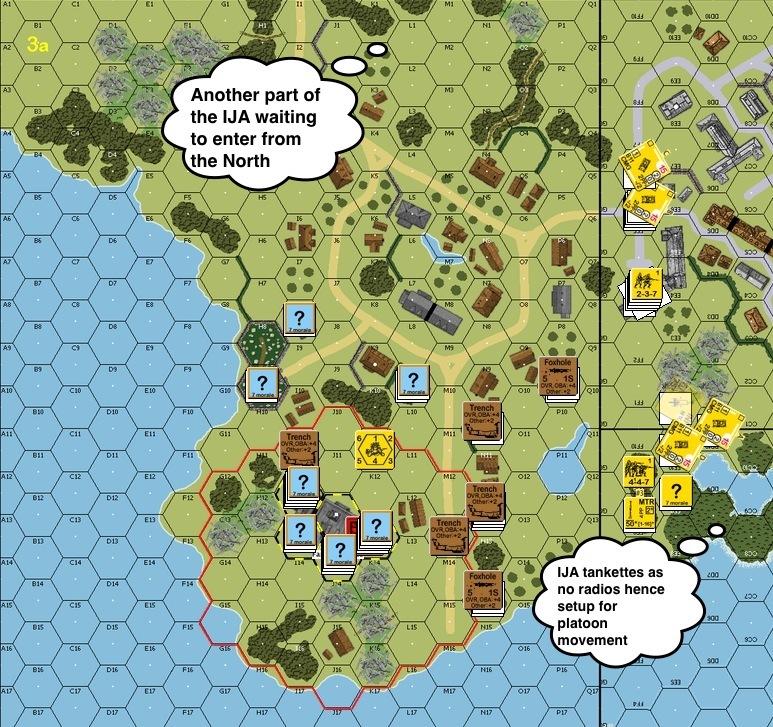 From the AAR’s Shaghai in flames appears to be much more unique (which is rare in a scenario). A lot of people would not care either way but I do think extra historical flavour can raise a scenario to another level.. I agree. I am a sucker for a good historical storyline. Jackson, Le Franc Tireur also has a treatment of this scenario, FT137 300. Yes .. there are four in total I think, it’s probably the one battle that’s covered more than the Marco Polo Bridge incident!